The Vision T9700 S treadmill is a huge and powerful machine with basic features. It is similar to the Vision T9700 HRT, but without any pre-programmed or user workouts. This machine is intended for the corporate market-hotels, rehab centers, and corporate fitness but if you’re looking for a durable, high-end, home treadmill with an easy to use console, then this machine would also fit that. 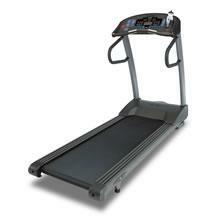 This treadmill boasts a 3.0HP continuous duty Cambridge motor that has a max speed of 12mph and a max incline of 15%. So it doesn’t matter whether you’re a beginner or an advance runner, this motor can give you the high intensity workout that you need. The 20” x 60” running surface is longer than your usual Vision. It provides more room for you to move and workout which is perfect for tall people who usually require longer strides. Plus, it still has the 8 variable-durometer elastomers which cushion harmful impact on your knees, ankle and back for a safer, more injury-free run. A 1" reversible phenolic deck (both side coated) was used in the Vision T9700 S treadmill. This deck is more durable than your ordinary decks. And, it is coupled with a 2-ply Siegling® Cool-Weave™ urethane high conductivity belt so expect this treadmill to withstand numerous intense workouts. The console is an Advanced SMART-MATRIX™ HRT® with 2 LED windows that has a Scrolling Message Center to motivate you. This console shows you your speed, distance, time, calories, elevation, pace, heart rate, and avg. speed so you can always measure your progress. Moreover, you’ll still get the 9 speed and elevation quick keys so you can easily make adjustments on your workouts. And finally, this machine comes with a decent home warranty. It has a lifetime warranty for the frame and motor, 5 years for electronics and parts, and 2 years for labor. The only problem I have with this warranty is that comparable treadmills from other quality brands in this price range have longer parts warranty. The recent $300 price increase is definitely a weakness. Now, a lot more people won’t have the budget to afford it. Also, the short parts warranty that I’ve mentioned above should also be taken into consideration before deciding to buy. I would not recommend the Vision T9700 S treadmill. If you really want a premium priced home treadmill, I suggest you stick with brands known for making high end models like Landice or Precor. Or, you may visit our best buy treadmills if you need more quality treadmills in this price range. If you plan on buying a Vision T9700 S treadmill, I suggest you buy it at vision. They offer the best price around the net. You can get it for just $2,199.